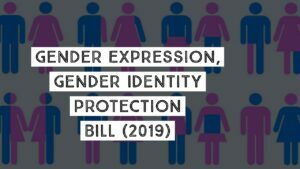 Gender Expression, Gender Identity Protection Bill that will amend the New York State’s Human Rights Law to protect all binary gender, nonconforming employees, and transgender employees from discriminatory treatment. Under federal law, since 2010, women returning from maternity leave who are breastfeeding, nursing parents – are entitled to a clean, private, non-restroom, non-bathroom space in which to express milk; to take a break and to lactate on a similar schedule to what your baby would be doing, nursing, if you were home, two or three times a day. Otherwise, it’s very painful, you can develop mastitis, it may interfere permanently with your ability to breastfeed, and it’s illegal. Happy July 4th! Paid Maternity Leave Finally a Reality in NY! Here’s one thing all pregnant working women in the United States now have in every State in the Union, and that’s the right not to be treated differently, not to experience hostility, backlash, a diminution, a degradation to the terms or the conditions or the privileges of your employment because of your pregnancy, because of your childbirth, or because of a related medical condition. if your company has at least 50 employees, you are covered for up to a year after your baby is born, you are permitted, and they are required to create, make this space for you to express milk and continue lactating during working hours. Unpaid time, but they can’t discriminate and they must permit you to do so. 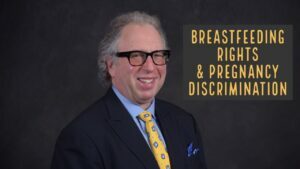 If your employer does not have 50 employees, approximately half of the states in the United States have their own lactation laws such as in New York, and Connecticut, where I practice law – both of those laws go farther than the federal law in protecting women who are lactating. 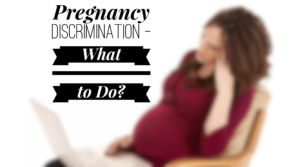 Pregnancy Discrimination: What to do? Pregnancy discrimination in the workplace is illegal, but it happens all the time. So you need to be proactive. It’s not as if your company’s gonna grow a heart, all of a sudden.